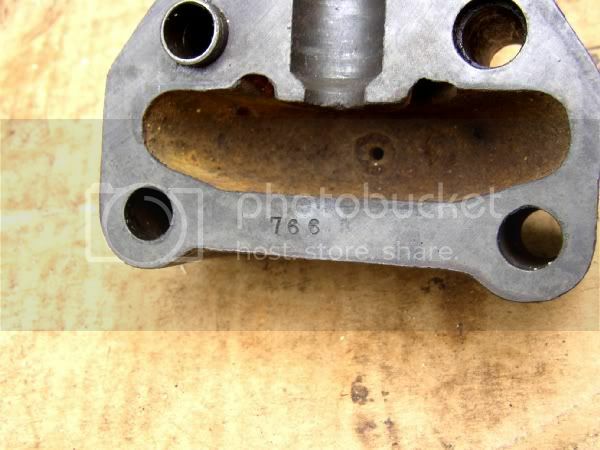 Rover Sports Register Forum • View topic - 1925 14/45 or 16/50 water pump and fan hub strip down. 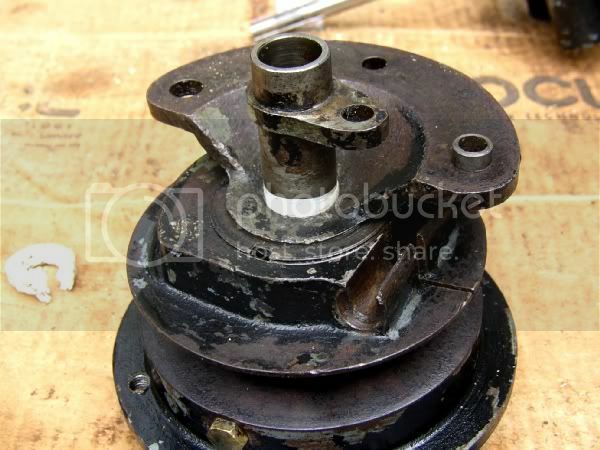 1925 14/45 or 16/50 water pump and fan hub strip down. The front of my 16/50 engine had a mayonnaise-like mess running down the front so I attemped to fix it. 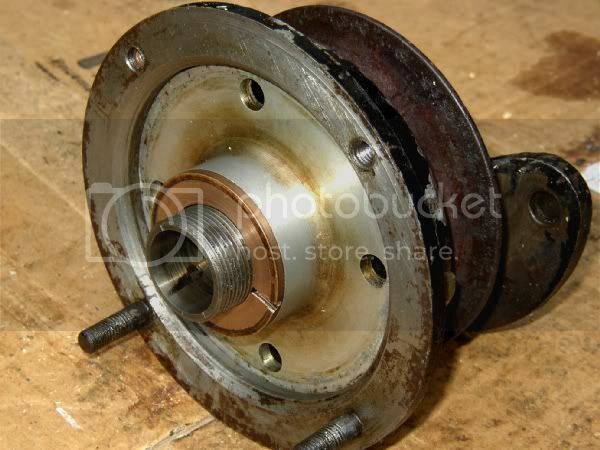 The following describes this early type of fan & pump arrangement, these fan hubs contain two bronze bushes lubricated by sae 140 grade oil, this hub also has the fan belt adjustment arrangement which closes up the V that the belt runs in. 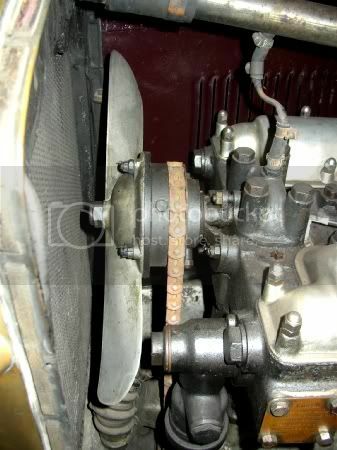 Later cars had a hub that had a ball-bearing which was grease lubricated and a different pump packing pressure sleeve along with a different fan. Inside the main shaft, which does not rotate, is the water pump spindle, which is driven by the fan itself. 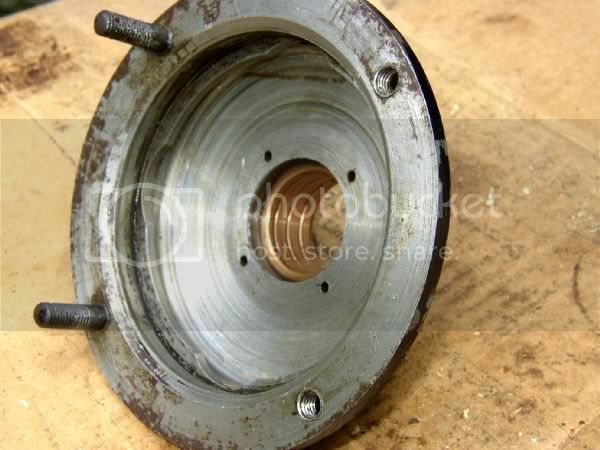 It is not possible to remove the spindle without removing the top of the pump casing. The four bolts that hold the pump casing to the cylinder head are also cylinder head bolts, I was reluctant to remove these bolts at first as there are no head tightening torque figures available but eventually they had to come out. 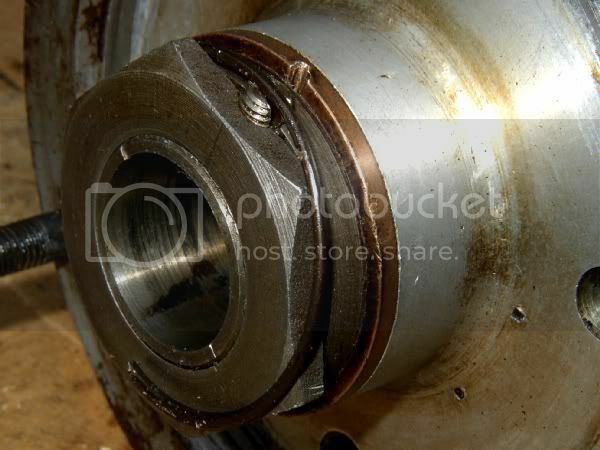 After removing the pump and hub complete, the fan was removed to reveal a locking nut on the main shaft. Removed the spring clip, grub screw and then the nut. 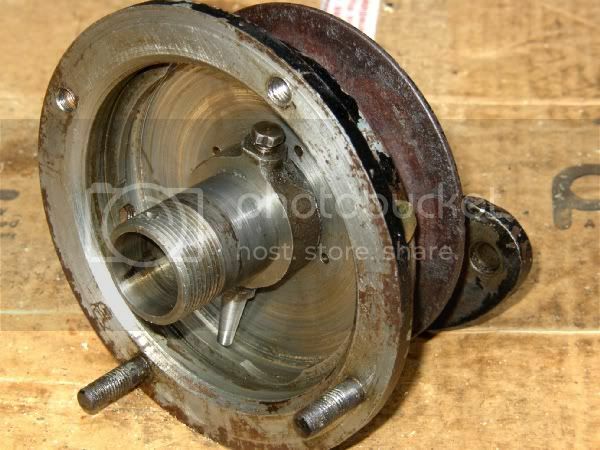 The pump shaft withdrawn from the fan hub. There is nothing holding this in, the spindle is driven by the splines at the front which engage into the centre of the fan. After removing the locking nut to show the front bronze bush. Next the disc with four holes was withdrawn complete with the bush. This required a puller, there is nothing holding this in other than friction. After removing the front bush disc revealed this collar, which I am at loss to give a proper name to as I have no idea exactly what it is for or what it achieves. The tapered section is a tube which lines up with a hole in the main shaft, there is another hole opposite to this hole which the locating screw locks into. Removing the screw allowed this to be removed. The outer case. 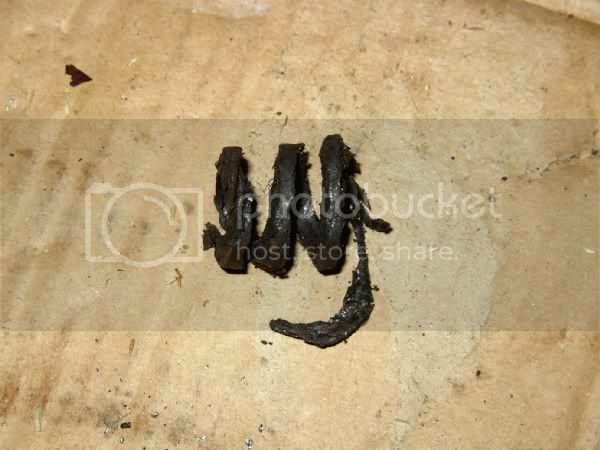 The rear bush can be seen with the spiral cut into it for lubrication. This is where the oil was escaping. 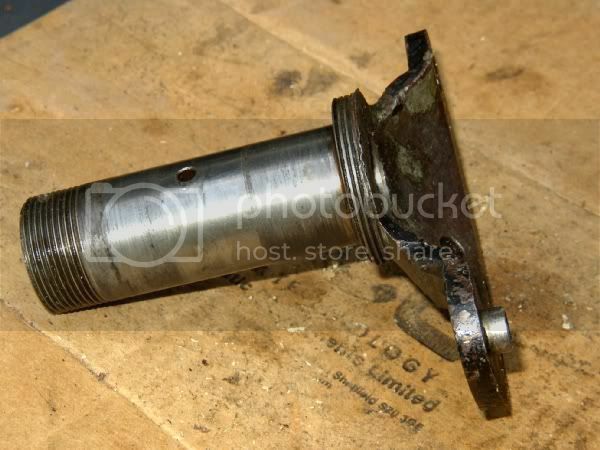 The main shaft, showing one of the holes for the collar described above and just visible on the front (left) threaded section is the drilling for the grub screw to locate the locking nut. 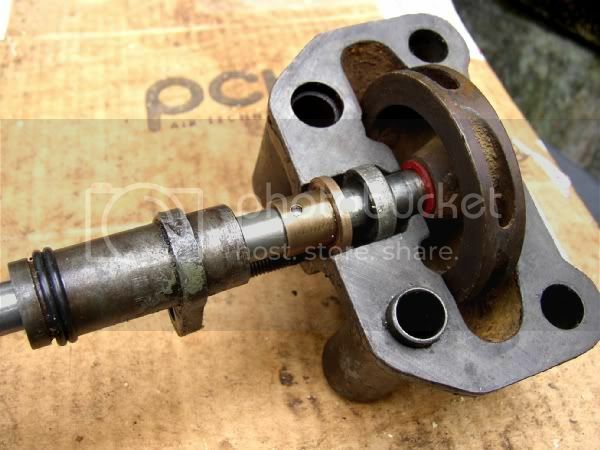 Original water pump packing in pretty poor condition. Replacement modern packing. Two rings like this were eventually packed into the gland but they could not be fitted until after the pump top was back on the cylinder head. Showing gland packing arrangement without the packing, The brass sleeve acts on the packing, the outer sleeve puts pressure on the brass sleeve. Originally there was a thin ring of leather in the groove at the front end of the outer sleeve, this disintegrated. I tried to replace it with a couple of ‘o’ rings, this was a failure as it would not fit into the housing, the ‘o’ rings were removed and replaced with quite a few turns of PTFE tape. 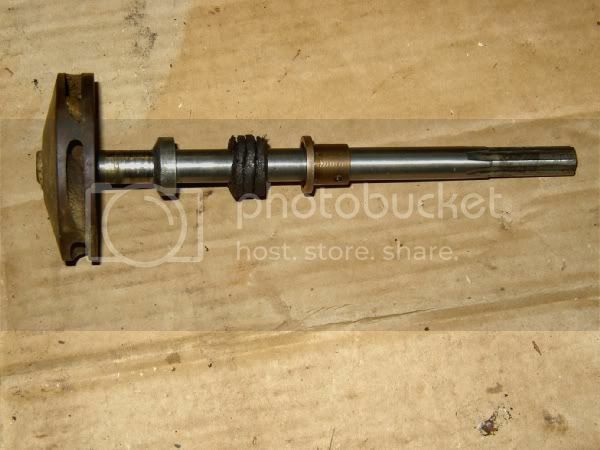 Neither the sleeve nor the main shaft of the hub that it fits into rotate. I fitted the red fibre washer to provide some clearance, there was nothing to stop the pump impeller running against the casing as the shaft is floating. Outer sleeve being inserted into the fan hub main shaft, note the PTFE tape mentioned above. Pump top casing detail, shows serial number which is also stamped into the opposite face of the cylinder head. Thought to be the serial number of the cylinder head, which may or may not be the same as the engine or crankcase numbers. These engines have a very complicated history which we are still working on, if you want more detail. or can add to the debate, then please contact me directly. Note also the small breather hole to allow air to escape from the pump. Reassembling the hub. 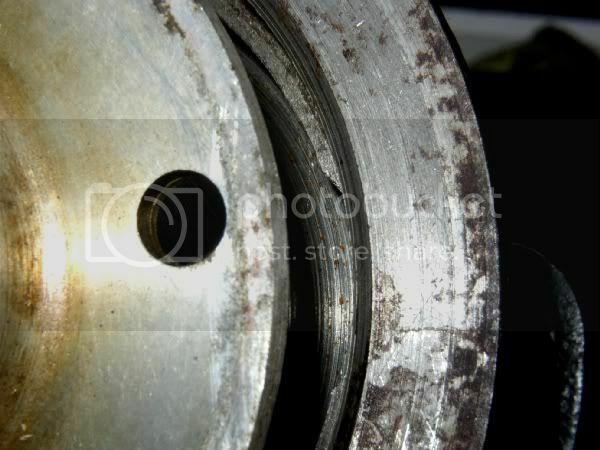 The front bushing disc has four holes, these originally lined up with four semi-circular cut-outs in the outer casing just visible here but there is nothing to lock the disc in place except possibly friction from the fan itself. Locking nut back in place. The nut was tightened up until the assembly started to rub, it was then backed off slightly, a new drilling made for the grub screw and the grub screw tightened up. The spring clip is shown here being out back into place. No more pictures I’m afraid, frustration and tiredness got the better of me but suffice to say that after making a new gasket and getting the pump back onto the head the packing rings had to be squeezed into the gland with very little room to work. Bolts were tightened down as much as I dared without knowing what the torque should be. 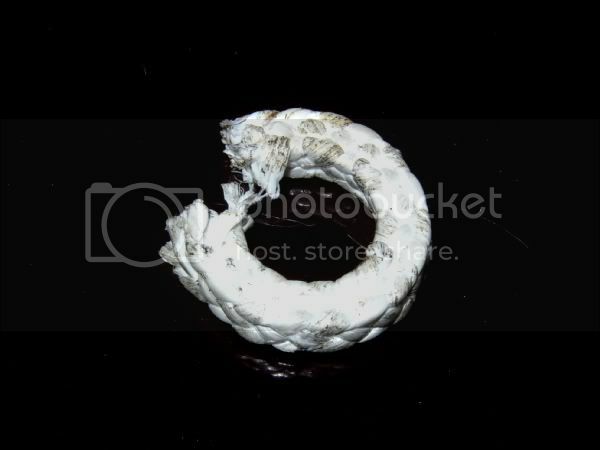 The hub was filled with Castrol D140 which then leaked out overnight. Hub was then filled with fluid chassis grease, which did not leak out, although a small amount did escape during the first time out, about 40 mile run to the Lakes Rally. So, although the hub still leaks a little, I have solved the water leak and reduced the oil running down the front of the engine to dribble of grease. 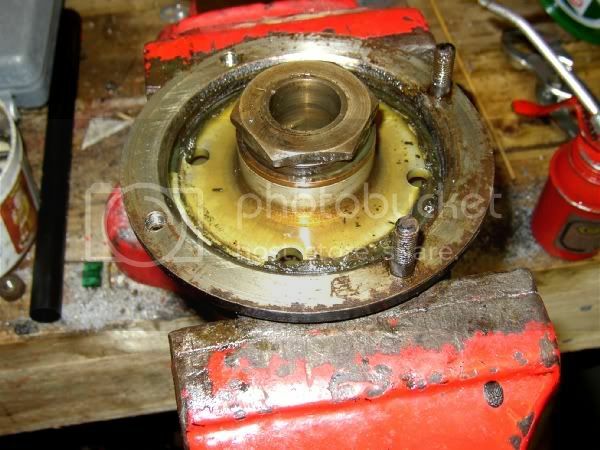 Re: 1925 14/45 or 16/50 water pump and fan hub strip down. Good stuff - but this is just the sort of job that makes me glad that my car is half a century newer! Yes, but in 50 years time this could well still be roadworthy as almost everything is repairable, most modern cars will be scrap because some piece of electronic wizardry (like the ECU or headlight switch) will have failed and it will be obsolete making the whole car scrap. My electrics consist of a starter motor, dynamo, non-dipping headlights, sidelights, a single brake light (retrofit), a number plate light, one light on the dashboard and a Klaxon which is backed up by a bulb horn. It might take me a few minutes to get the hood up and down as opposed to a few seconds but I can maintain it with an oil can. The oil pressure gauge is a Bourdon tube and the speedo is mechanical (both just back from overhaul by Speedograph Richfield), the wiper is next to useless but is mechanical being driven by a speedo cable (replaced two years ago again by Speedograph Richfield), the petrol gauge is a vacuum device (I replaced the seal with one from a Ford Fiesta slave cylinder), the fuel is delivered by Autovac (repairable), the 8-day clock is mechanical (repairable) and the water temperature gauge is a thermometer stuck in the top of the radiator. The biggest long-term worries are corrosion of the cylinder block or head, both of which would be a nightmare to replace, the availability of tyres which are already expensive and legislation instigated by the eco-police banning old cars from the road. This is the kind of items the forum requires. If any forum members are repairing their Rover, be it from the 1920s through to the 1990s why not take a few minutes to take some pictures as you go along, then when the repair is finished and you have some time to spare, write a report and post it here for all to see. Stewart, if the ECU on my car dies and can't be replaced (although I have a spare) I will be able to make/have made a new one. Megasquirt open source DIY engine management allows people to build and tune their own ECUs for cars of all ages. Richard, that's very useful to know, but is Megasquirt of any use for diesels? Mike, the website says "spark ignition" so it looks like the answer is no. A while back Practical Classics used a similar system (maybe even Megasquirt) to convert an A40 and an Imp to MPI. I think the point of this is that there is a fundemetal difference in how vintage cars are built, repaired and the fact is that they can be even when they appoach a 100 years in age. While newer cars can be they will either require a specialist or back up spares. Clearly it just took a bit of pleasurable time to rebuild Stewarts water pump somthing you cannot do on a car built much after 1960. The appeal to me is the cars were so well built that it can be repaired without more then a few tools. and a bit of packing and this is how it was intended to be repaired and this has held true since it was built. That's true up to a point - but, for example, many older cars require specialist skills backup for remetalling and line boring of main bearings whereas newer cars can have new bearing shells fitted at home in your living room or shed. Hi, Just joined this forum and hope you can give me some of your knowledge regarding the 16/50 you have. Before I commit to the purchase of one that is for sale in Victoria Australia.